Features of relationships such as love and closeness are not post hoc conceived of in response to a primary, material experience that does not contain them inherently. Instead, these existential elements can be perceived and known directly from the relational experience. 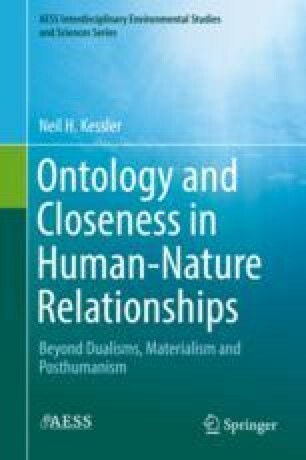 With materialism and other human/nature dualisms accounted for, the ways in which one comes to know about these kinds of relational elements expands. The methods can include American pragmatist Charles Peirce’s notion of synechism of feeling, which is the relational continuity or sharing of feeling as an existential phenomenon surrounding and subsuming relational partners. Other forms of relational knowing include the sensory-emotional notion of poetic knowledge, the idea of “personal acquaintance knowledge” as knowledge about the “other” through the lens of the relationship between Knower and Known, and propositional knowledge once it has been cleansed of human/nature dualistic elements like detachment-promoting scientific objectivity and reliability.